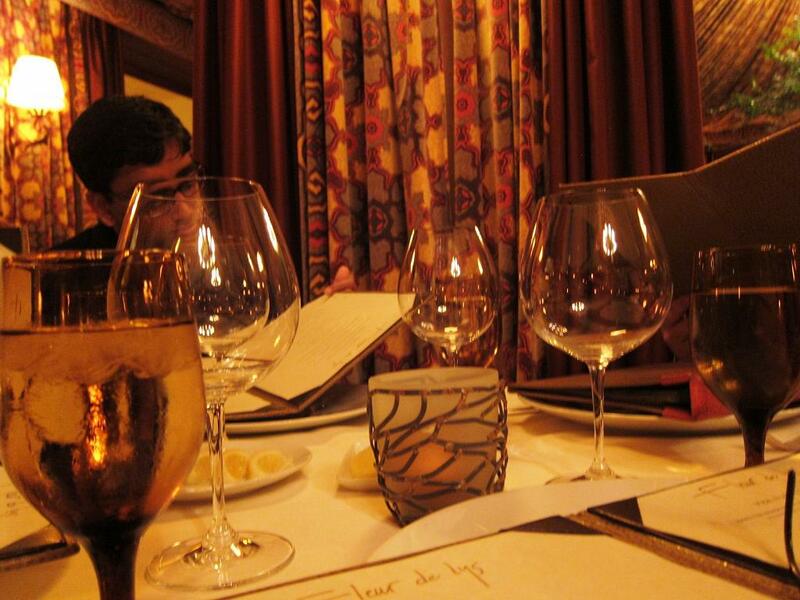 Fleur de Lys has always been considered one of the most romantic restaurants of San Francisco. Old style French with its heavy drapes of richly patterned fabric, decorative wrought iron candle holders and an overall sophisticated ambiance, this restaurant presents the cuisine of chef and owner Hubert Keller. Hubert Keller - a different Keller than the famous Thomas Keller of French Laundry fame - is known for his attention to detail and expertise in French haute cuisine. In addition to his signature restaurant in San Francisco, Keller now helms Fleur within Mandalay Bay in Las Vegas and a gourmet Burger Bar in three cities. Incidentally, Burger Bar has on its menu a $60 Rossini burger made of kobe beef, sauteed foie gras and shaved truffles! The last time I was here, I remember being delighted by both the food and the overall ambiance and also had a picture taken with the chef himself. This one was an equally satisfying experience too. We had walked about ten blocks to this restaurant from the W Hotel in downtown San Francisco - past Union Square and in the middle of the theater district. After checking in our jackets, we got down to business. I began with the Artisan Foie Gras and Smoked Duck Breast 'Torchon' garnished with Spanish almonds, bacon brioche on top of a pineapple slice in a vanilla consomme. 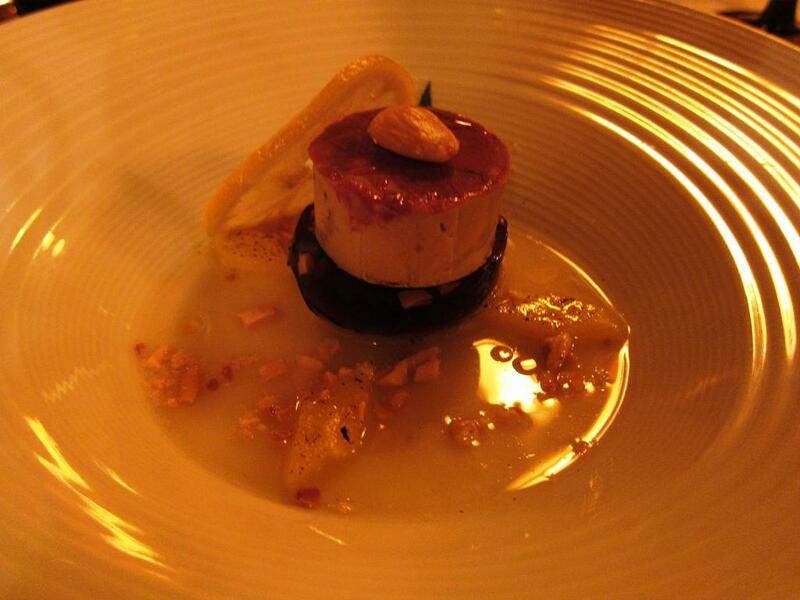 The torchon is a method of cooking foie gras in which it is placed in a towel and poached. 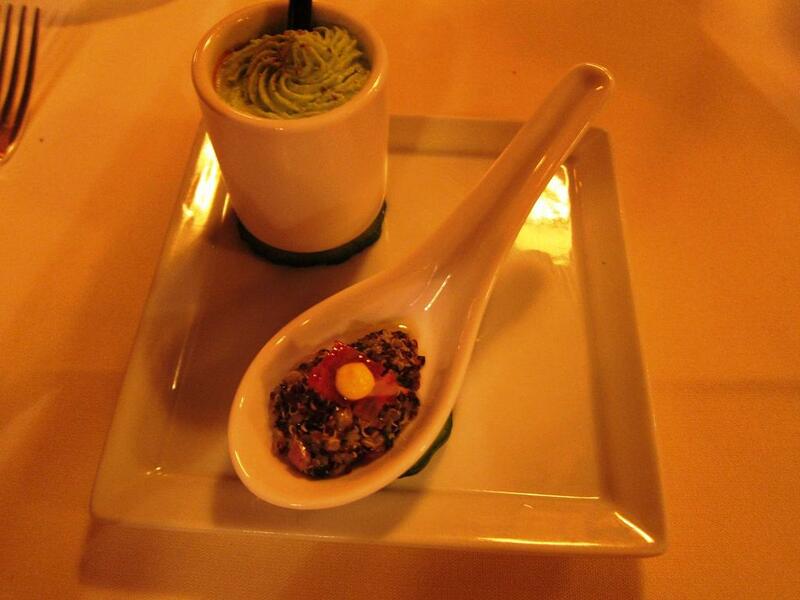 The flavors and textures were well executed. 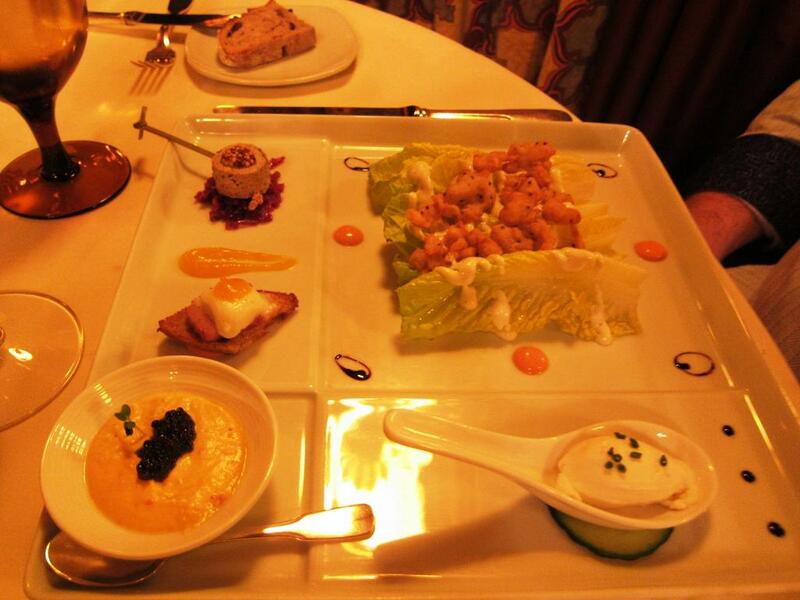 However, my companion's trio of petite Ceaser salad, foie gras lollipop and tuna fondant looked even more appealing. I moved on to the Seared Fillet Mignon which was served with a side of Lobster Truffled Mac and Cheese en brioche and accented with red wine, shallot and thyme bordalaise sauce. As you can imagine, the dish was quite superb! 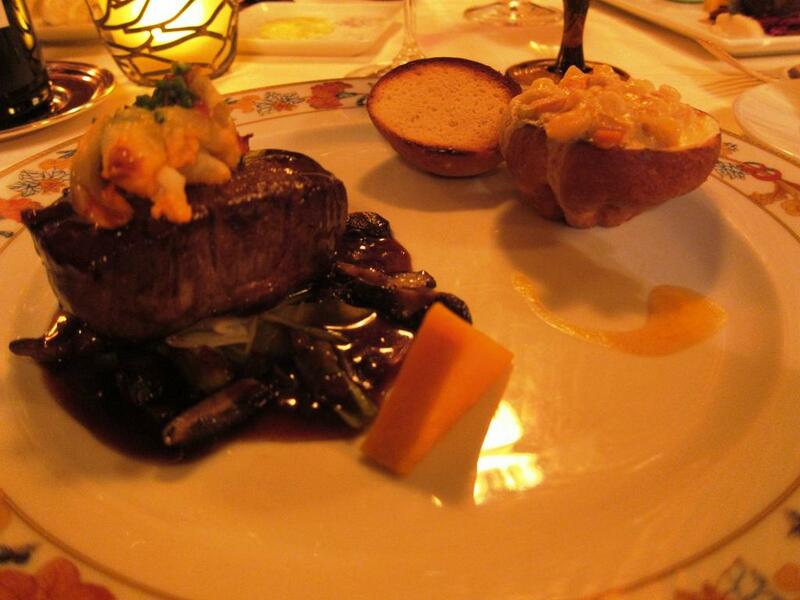 The meat was tender and flavorful and served on a bed of leeks and mushrooms and the rich sauce. Classic bordalaise sauce is usually made with dry red wine, bone marrow, butter, shallots and a rich brown sauce called demi-glace. Another version popular in New Orleans cooking is a little different in that it uses garlic rather than marrow and red wine. The Mac and Cheese itself was worth ordering the dish for! We had pre-ordered the Grand Mariner Souffle for our dessert and this turned out to be a good choice. 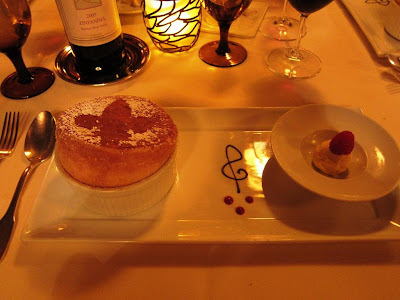 Served with orange sauce and an orange and cardomom ice-cream, the souffle was everything you want it to be - fluffy and light as a feather and very enticing on the palate. Overall, this restaurant continues to be a winner. Another of those rare Bay Area restaurants where the chef doesn't change every year - which ensures your next experience will be as good as the one you remember.